An exquisitely colourful exploration of the animal world with fold out flaps and die cut pages, written by the bestselling Julia Donaldson. A splendidly die-cut alphabet of animals from Number 1 bestselling author of The Gruffalo, Julia Donaldson, and visionary illustrator Sharon King-Chai. Each cleverly cut flap draws you further into a beautifully vibrant world of huge elephants, slithery snakes and growling tigers. 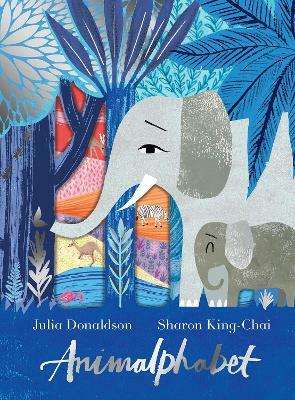 Sharon King-Chai's bold colours and shapes make Animalphabet a rich delight for children of all ages while Julia Donaldson's rhythmic text is a pleasure to read aloud. The cleverly written, simple text invites children to compare one animal to another, and clever hints and peep-through holes within the artwork make this a hugely entertaining guessing game as well as a gorgeous book to treasure. The perfect gift for boys and girls alike who will love embarking on a journey of discovery through the natural world, from one animal to another.